Clariant has announced the approval by its board of directors to invest in a new full-scale commercial plant for the production of cellulosic ethanol from agricultural residues using its sunliquid technology. The new plant will be built in Romania. Archer Daniels Midland Co. released third quarter financial results on Oct. 31, reporting increased earnings for the Bioproducts segment due to better ethanol margins. Overall, the company reported adjusted segment operating profit fell 17 percent. 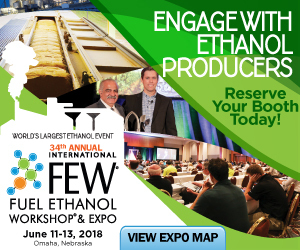 Some ethanol producers and marketers are taking advantage of the higher renewable identification number (RIN) values to offer denatured ethanol as low as 30 cents per gallon and E85 at 55 cents per gallon (plus tax and freight) this week. Growth Energy recently announced that in just five months, American drivers have surpassed another billion miles on E15, bringing the total miles driven across the U.S. to 2 billion. More than 1,000 fuel stations in the U.S. now offer E15. The U.S. EPA has released renewable identification number (RIN) data for September, reporting that nearly 1.6 billion RINs were generated during the month, including nearly 21.36 million cellulosic RINs. Valero Energy Corp. has released third quarter financial results, reporting that its ethanol segment earned $82 million of operating income during the three-month period, down from $106 million during the same period of last year. Novozymes has released third quarter financial results, reporting a 4 percent revenue growth during the first nine months of the year. Revenue for the company’s bioenergy division grew 10 percent over the same period. Pennsylvania Gov. Tom Wolf recently asked President Donald Trump to waive the Renewable Fuel Standard renewable volume obligations (RVOs) for Northeast refiners, citing high renewable identification number (RIN) prices. Lallemand Biofuels & Distilled Spirits, a business unit of Lallemand Inc., has announced the acquisition of Lactic Solutions LLC, which has been developing genetically modified lactic acid bacteria products specifically for the biofuels industry. Greenbelt Resources Corp. has agreed to perform feedstock testing with Central Coast Wine Services to test various streams of wastes generated in the winemaking process. The wastes will be tested for use as feedstock for Greenbelt's technology. Drivers of flex fuel vehicles (FFVs), which can handle higher ethanol blends up to 85 percent, now have even more places to fuel up. According to E85prices.com, there are now more than 4,000 stations throughout the U.S. offering E85. The Biotechnology Innovation Organization and 66 renewable chemical producers recently asked the House and Senate Committees on Agriculture to reauthorize the Farm Bill’s Biorefinery, Renewable Chemical, and Biobased Manufacturing Assistance Program. Pennsylvania’s travelers have expanded opportunities for filling their vehicles with renewable fuels thanks to a $7 million grant that allowed Sheetz Corp. to expand ethanol availability to 340 more fuel pumps at 77 store locations across the state. The U.S. Department of Agriculture's National Institute of Food and Agriculture recently announced 17 grants for research on the next generation of agricultural technologies and systems to meet the growing demand for food, fuel, and fiber.